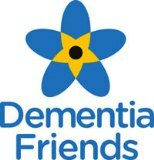 Become a Dementia Friend …. It’s easy! Last Thursday I attended a 45-minute training session to become a Dementia Friend. The training was led by Betty Machin and Jane Snape from the Dementia Advocacy Project at the Beth Johnson Foundation and the aim is to help to create more dementia-friendly communities. Becoming a Dementia Friend does not mean that you have to take on additional responsibilities if you do not have the time, but just to be more aware, mindful and considerate to others situations and behaviours in your day-to-day activities. There are many ways that you can help to spread the word about dementia, every action counts!